San Diego, CA, December 6, 2006 -- The UCSD division of Calit2 exhibited a handful of its cutting-edge technologies at the CommNexus 6th Annual Gadgetfest, held last week at the La Jolla Marriott. 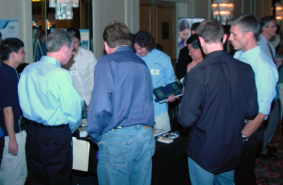 Response to Calit2's first appearance at the six-year-old mini-tradeshow for San Diego-based companies was very positive. Visitors to the booth were intrigued by the technology and its possibilities. Joe Simone of DMH Inc. succinctly summarized the reaction of many to Calit2's projects: "The technology looks great, very cool." Gadgetfest was designed to feature today's hot new gadgets, applications and software. The majority of the attendees were telecom industry professionals from the area. Six Calit2 technologies were showcased, reflecting the work of dozens of researchers on institute projects, including RESCUE, ResponSphere and WIISARD. Calit2 technologies showcased at Gadgetfest '06. "This is interesting and good technology," commented Steven Stilwell of the Ardell Group. "For the personal pollution sensor, there are definitely applications for broader use; it could be a great product." More than a dozen Calit2 engineers, scientists and students were on hand answering questions and demonstrating devices. Each of the projects received a lot of attention. Some visitors were interested in the broad range of devices, others wanted to drill down into the technical details of one or two. One such visitor from a large telecommunications company was impressed with CalMesh, and expressed a strong interest in attending UCSD for graduate school and doing research with Calit2. More than a dozen Calit2 engineers, scientists and students were on hand answering questions and demonstrating devices. The WIISARD triage tags with their blinking colored lights indicating patient status served as beacons attracting the attention of Gadgetfest attendees. Two MBA graduate students from the UCSD Rady School of Management visiting the booth separately came to the same conclusion: that the electronic patient tags are marketable. "There are some questions," said Saleem Van Groenou, "but, it could be a really exciting opportunity." Added Alex Chan: "This is very interesting technology, very unique for the market. I would be interested in seeing it in the market some day." The formal title of the event - the 6th Annual GadgetFest Ho' Down and Shoot-out - reflected the Wild West theme. The entrance was complete with real haystacks and (fortunately) fake cactus. In addition, several cowboys in Stetsons were easily spotted across the packed exhibition floor. Following the Round-Up (tradeshow), the Gadgetfest Ho' Down ended with a 'Shoot-Out' - a competition among the public sector exhibitors for bragging rights to this year's best gadgets. Stephan Steinbach explains GroZi, Calit2's project to create a grocery store assistant for the visually impaired. "It was great to see how successful products innovate around familiar technologies with an eye on serving user needs," observed UCSD division director Ramesh Rao, "such as the handy Sony Reader and the Celestron SkyScout." The eBook reader by Sony and Celestron's SkyScout, a GPS-based star locator, each won the shoot-out in their respective group. 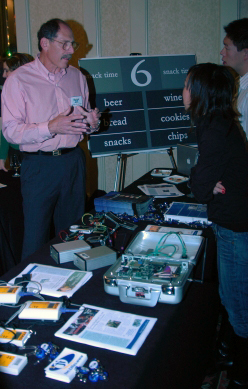 Gadgetfest is held annually by CommNexus San Diego, a non-profit network of communications companies, service providers, and professional trade groups within the public sector. 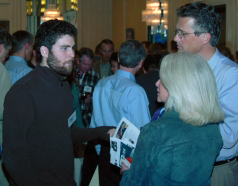 Until October 2006 the organization was known as the San Diego Telecom Council. This is the first time Calit2 has participated.